(CNN) -- The death toll from a string of hurricanes and tropical storms in Haiti has risen to nearly 800 people, an official with the Haitian Red Cross says. A man carries drinking water through the flooded streets of Gonaives, Haiti, last month. Jean Pierre Guiteau, the group's executive officer, said they suspected the numbers may climb further because many people were still missing. 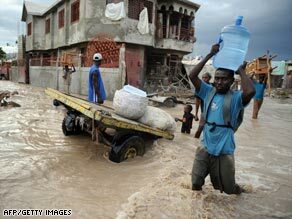 Heavy rainfall from four major storms in August and September created fatal flooding and mudslides in Haiti. Tropical Storm Fay caused flooding and significant damage when it hit the impoverished island nation. Heavy rains from Hurricane Gustav, considered a major hurricane, caused destructive mudslides after it made landfall in Haiti on August 26, the U.S. National Hurricane Center said. Tropical Storm Hanna passed over northern Haiti in early September, bringing heavy rain and flooding. Ike, another major hurricane, caused flooding and mudslides. The United States has provided more than $30 million in humanitarian assistance to Haiti in the wake of the storms, the U.S. Agency for International Development said. The United Nations' Central Emergency Response Fund has allocated more than $4 million for post-hurricane humanitarian aid, the agency said. The U.S. Navy sent the USS Kearsarge to Haiti last month to deliver more than 1,400 metric tons of relief supplies, in support of USAID and the World Food Program. It delivered heavy lift helicopters to carry rice, water, plywood and other supplies to Haitians, and also carried medical and engineering teams to remote parts of the country. Even before the tropical weather struck Haiti, an estimated 2.3 million Haitians had fallen into food insecurity, with dramatic increases in prices for staple foods, USAID has said.